Beautiful setting and excellent location. David and Claudine welcomed us to their gite, after coming to find us as we got a little lost. The gite is well equipped, stylishly decorated and comfortable. The location is very quiet and excellent location for some star gazing. You can walk to the Overload Museum and American cemetery. We took a drive to the beach but you could walk if you wanted to. Several other Omaha museums are within a very short drive. We had a welcome bottle of David's home produced cider which was delicious. We were left to enjoy the tranquility of the gite but with knowledge that David or Claudine were close by if we needed anything. Overall a most enjoyable stay in Normandy. Beautiful setting. Perfect for exploring Normandy. I would whole heartedly recommend staying here. We travelled to gite Epervier with our 2 children aged 11 and 13. 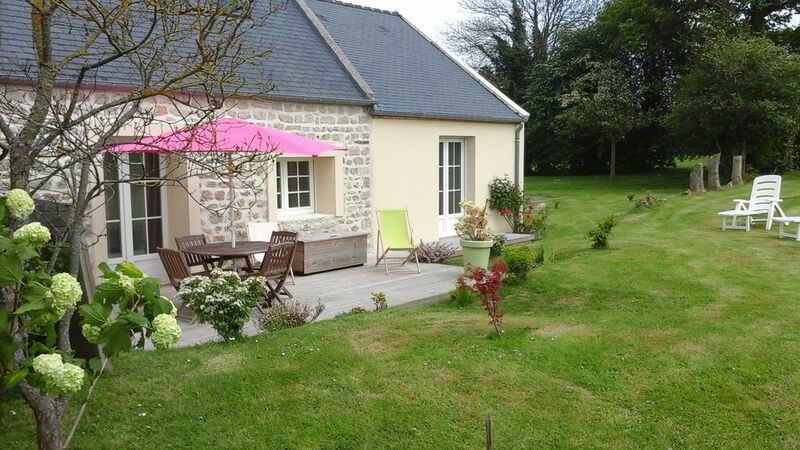 The gite itself was set in a lovely village and quite close to the beach. On arriving at Colleville Sue Mer we were met by David and his wife who showed us around the gite which was lovely and had everything you needed. The wide open space of the garden was appreciated by the children and very relaxing and peaceful . We had some great days out as the gite is centrally located for Bayeaux,Arromanche, all the landing beaches and American cemetery. The children really liked rail biking(velo rail) Thankyou for a great week. We would highly recommend this cottage. Our party of four adults found this to be a lovely comfortable base for our visit to Normandy, which took in the D-Dy beaches and museums, Le Mont St. Michel, Bayeaux and Ouistreham. If the weather permits, the local beach at Colleville-sur-Mer is excellent and the sea was lovely to swim in, watched over by a life guard. The property is in excellent condition and was spotlessly clean. Beds were comfortable and the kitchen is well equipped. The bathroom has a good efficient shower. The gite is set in peaceful rural grounds and, for sky-watchers, the lack of light pollution is fabulous. The home made cider and aperitif that were in the fridge on arrival as a gift were most enjoyable! If visiting the area again, I would certainly stay here again and I can heartily recommend the property. My family: 2 adults and 2 children (13 and 14 years) had a lovely stay in the gite L'Epervier. The children had there own space "upstairs" with games and tv. The compleet kitchen (dishwasher / oven / washing machine) were very convenient. Also the wood burner was a big plus in a beautiful rural surounding. The location was perfect for visiting the D-Day Landing beaches/museums and the famous tapestry in Bayeux. Lovely restaurants in Quartier Vaugueux in Caen. The property owner had lots of discount vouchers for several interesting museums etc. We definitely come again. Try the homemade appelcider we loved it. Greetings from The Netherlands, Nieuwegein. Nous avons passé quelques jours très reposants dans ce gîte restauré avec goût. L’accueil de notre hôte a été très chaleureux, tout comme les soirées au coin du poêle. Le gîte est idéalement situé pour visiter la région que ce soit pour le côté historique ou balnéaire. Ne pas oublier de ramener dans ses valises avant de partir quelques bouteilles des excellentes productions maison de cidre, pommeau et calvados. (Text automatically translated) Restaurant at The Firs vierville .. very nice frame. Veolia for any water activity.